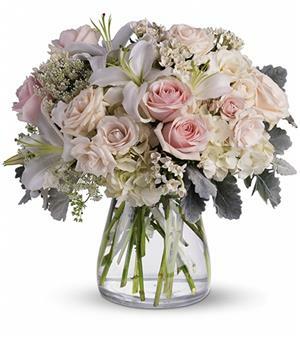 Soft as a whisper, this elegantly feminine vase of delicate pink and white roses, hydrangea and lilies is a simple and heartfelt affirmation of love and devotion. Order this light pink rose bouquet for your special someone, to let someone know you are thinking of them, sympathy arrangements or any special occasion. Want your flowers to be delivered today? Order now for same-day delivery in San Diego! Short and compact vase arrangement in the blush and white colors.